We continually deal with water in our business. Either it is a problem that needs to be solved in the pump or a process involving water. It many times revolves around the physical chemistry of water and its' various phases. Gas, liquid, steam or ice. Water behaves like any other liquid when we hit it with a vacuum the following explanations are meant to impart some of this knowledge and how it might effect your own process or problem. PV=nRT, Boyles Law, Charles Law with volume kept constant we can simplify the equation often to P=T or pressure is inversely proportional to temperature for most any liquids. 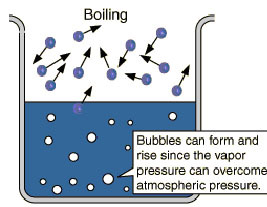 The boiling point is defined as the temperature at which the saturated vapor pressure of a liquid is equal to the surrounding atmospheric pressure. For water, the vapor pressure reaches the standard sea level atmospheric pressure of 760 mmHg at 100 degrees C. Since the vapor pressure increases with temperature, it follows that for pressure greater than 760 mm Hg (e.g., in a pressure cooker), the boiling point is above 100C and for pressure less than 760 mmHg (e.g., at altitudes above sea level), the boiling point will be lower than 100C. As long as a vessel of water is boiling at 760 mmHg, it will remain at 100C until the phase change is complete. Rapidly boiling water is not at a higher temperature than slowly boiling water. The stability of the boiling point makes it a convenient calibration temperature for temperature scales. for many other chemicals. You can imagine this might enable the user to vary temperature and modify the presence or removal of water without using necessarily higher temperatures which may degrade samples or effect yields.